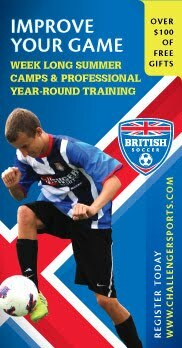 In Summer 2015, AYSO Region 390 will once again host Challenger Sports British Soccer Camp! The camps will be held from June 15 through 19, at Energy Solutions Field in Oak Ridge. There are camps for players aged 4 though 19, including an Advanced Competitive Camp and Goal Keeper/Striker Clinic for older players. All campers receive a soccer ball and t-shirt. Register online at least 45 days before camp starts, and receive a special free gift (shipping and handling not included) - a 2015 British Soccer Jersey! For more information about the camp in Oak Ridge, email our local camp coordinator at soccercamps@aysoregion390.org.